The flood-lit Al-Zawawi Mosque with its illuminated yellow dome and the illuminated single minaret at the blue hour just before sunrise. 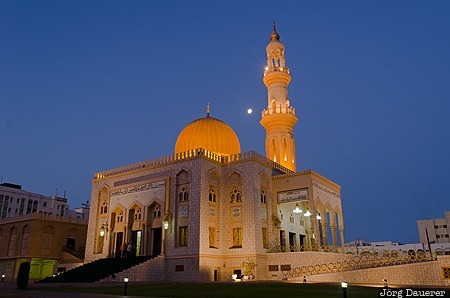 The Al-Zawawi Mosque is in Muscat Governorate (Capital Area) in the Sultanate of Oman. This photo was taken in the morning of a sunny day in March of 2012. This photo is part of the exhibition Blue Hour (October 2016). This photo was taken with a digital camera.